What to look for in a Yacht ? Offshore, costal, liveaboard, sabbatical, world cruiser, med cruiser, summer sailor, weekend sailor ? ‘Keep It Simple Stupid’ KISS we’ve read this in so many publications over the years but at the end of the day it is so true for all sailing, Don’t over complicate things you are most likely to have to repair them, have a backup system for everything, carry a good stock of spares and check your boat all the time. A serious option if you want to be involved in the build and know your yacht inside an out, after all it is going to be you home for a long time. Whilst plenty of boas for sale on the brokerage market good blue water cruisers between 4-10 years old can be in short supply, purchasing a yacht over 10 years old is going to require investment and upgrades to your required spec. So new can be a serious option. Look after and maintain your yacht and when you come to sell you will see a sensible market return. But remember there is not a price attached to the 10 years pleasure you have had with cruising, be realistic with your expectations on re-sale value the market is always changing. 2.Custom Built: Be careful with this option, custom or semi-custom built yachts will take longer to build and the will cost more but you are getting exactly what you want. There will always on any new yacht be items to ‘sort out’ and whilst this yacht has a high value to you when you come to sell these features may not make her as valuable as you think for the next owner. Custom builders such as Garcia Yachting specialists in Aluminium are a respected choice in custom building whether that be a Monohull or Catamaran. On the second hand market right now there are tens of thousands of liveaboard yachts round the world for sale. There is no perfect yacht so compromise is everything and the cruiser you are looking for may not be within budget either so be flexible and if you are you will be on the water living the dream rather than spending several years chasing it. Keep an open mind, take the advice of your broker tell them what your plans are, budget and time scale, read up on some of the cruising forums, make safety a priority as well as comfort. There are some fantastic yachts for sale out there by owners who are finishing what you want to start. It’s easy to get carried away but really the fundamental aspects of buying are price related to size. New will cost more with your equipment lasting longer, older will be in budget but you will have to invest in equipment upgrades. Over spending is easy to do, keep a careful eye on this, over doing it on the initial spend can seriously affect or delay your plans and spoil the dream. Know what are the essentials draft a wish list and set aside an emergency fund just incase. Size needs to be taken into context with what cruising is to be done. What are your plans for cruising, distance, comfort, location, your age, health but generally yachts under 38ft will not offer the long term cruiser what they want. Of course you can go bigger, 50ft is not uncommon, but for couples the yacht has to be safe and manageable for two as well as all the ancillary sailing equipment to be used, maintained and stored. 45ft is perhaps the optimum for a couple living on board long term and cruising offshore and with modern systems be they mechanical or electric it has meant handling a slightly bigger yacht is easier. Budget though will obviously affect what you choose. If you are going to live aboard for months if not years you’ve got to be comfortable on your cruising yacht. It’s not just the layout but brightness and the ergonomics of small space living, storage and facilities, access to all your daily living items and how you are going to sleep, eat or relax whether on a long passage or at anchor. You will be spending more time just bobbing that sailing. Now this is a tricky one and really falls down to personal preference at the end of the day, as the both have advantages and disadvantages over the other. There are purists supporting both and great arguments for both. 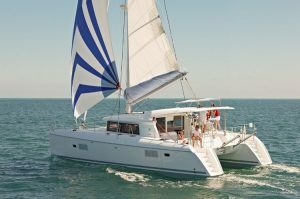 The monohull is a powerful single hulled cruiser, but lacks the size interior of the Catamaran making them great for interior and exterior space and living aboard. However some might not like the motion at sea, they are more weight tender and in a heavy sea really will struggle. A centre board monohull can just lift its keel and ride it out. The Multi hull is a difficult beast to sink if punctured, then mono hulls can be in steel and Aluminium as well as a Cat. When it comes to berthing the costs for multihull are obviously more expensive, but anchoring is free. The comparisons are endless and over the years there has been a growing trend to big Cats and cruisers perfect for the Med or Caribbean when most of the time you are just living not sailing. As we’ve said it comes down to personal preference, you either like multihulls or you prefer to sail free on a monohull. As cruisers up wind performance is probably more important than speed (true speed, boatshow topic of discussion) but give careful consideration on shorter passages to what you might save in terms of fuel and time on a yacht which sales well. Stability curves, polar diagrams don’t get too bogged down with these as there are factors affecting all these from tests done light (not fully cruise laden) to centre board lifting keels which are all tested with the keels up as the ballast and stability are in the hull the fin keels just help them point. Other pointers to throw into the blue water cruising mix that are not such great design features for live aboard cruising would be low freeboards and you will get wet, too high and up wind sailing goes downhill, very long bowsprits hamper marina movement, anchoring and changing sails especially in bad conditions, a light boat with shallow keel will heel uncomfortably likewise some classic built yachts with very short hull to waterline profiles. We always recommend you have a purchase survey and it is covered in other sections of our site in greater depth. Choose a professional that is experienced and can survey the whole yacht or advise on other professionals he would recommend to look at specifics. Your insurance company may well require an up to date report as well. Think of the general market trends that might affect purchase prices in different countries, the geography of buying. Your yacht many not be where you live so be prepared to travel to inspect. Currency fluctuations and economics can play a major factor in getting you a better buy or increased value for money. Crew/ the team – whose cruising with you ? Who will you be sailing with ? Whilst not a priority at first it is very relevant when you have guests or passage crew. At some point you will have visitors, their belongings and of course the costs of getting out to see you or even paying crew to sail with you. Then bring safety and experience into the equation, theirs and yours. So give thought to this at the beginning. Do a little home work on designers, see why they went down the route they did and how long they were designing for and how many builders have they worked for. You will find some that relate more to your needs than others. Bruce Roberts, Angus Primrose, Laurent Giles, Robert Perry, Bill Dixon, Doug Peterson are but a few of the names you will come across. There are many well know brand names out there but don’t be restricted to them. There are some extremely good one offs and custom designs as well as home builds but be careful especially on the resale value. Established pedigree yards that are still building today are a wealth of information and their websites hold ‘gems’ of cruising knowledge. History on build models, plans, spares and replacement manuals can often be obtained. HIN number identification for accuracy of build and their conformity to RCD standards are key to the process of identifying true age serial numbers for older yachts for sale. GRP – Generally the cheapest construction option, widely available and can be produced in many shapes and sizes. Has the least maintenance with many minor repairs being capable of most yachtsmen. Plenty of boatyards with skilled labour all round the world layup, thickness, blisters, hull balsa core, foam core, divine cell construction. But not as strong as other constructions. Steel – The choice for offshore cruisers, impact, strength, water tightness, deck fittings, sand blasted and epoxy coated, takes less time to maintain than GRP but could cost more. Hard to puncture, many custom builds or one offs from small yards to know designs. Many not have pedigree in build, but repair/modification work easier to find worldwide. Aluminium – Again the choice for Blue Water cruisers, Strength, lighter, strong, rugged and practical, difficult to hole. Chine or Round hull depends on the quality of builder. Best not to paint, expensive and can look poor after years of cruising picking up chips and blisters in the paint the hull below still being sound. Perhaps not as many places in the world for repairs. Owner repairs are difficult. Majority of modern builds have the electrolysis issue more than covered, cathode protection is essential. Quality Aluminium builders Allures, Garcia, Ovni and many Dutch yards. Wood – If well maintained looks very impressive, less popular now, lower in price but the cost of maintaining them far higher. A labour of love some are drawn to them irrespective of the additional costs. 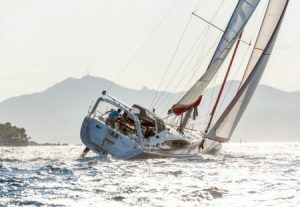 Insurance for offshore cruising may be a challenge. Aluminium, steel or composite decks with perhaps a foam core will be coated in a surface to stop you slipping. This could be teak, imitation teak products such as deck king or marine deck, gripping built into the mould or sections of non-slip pads stuck down, tread master being the most common. Teak decks have a life span and without question need to be looked after and when the time comes are expensive to replace. For liveaboard long distance cruisers they are perhaps more of a maintenance issue and cost than a valuable necessity. The condition of the sub deck if laid is always a question mark, what is happening to the core below ? They do look great though. Compromise and have decorative teak in the cockpit and stern platform. Depending on where you want to cruise high latitude or the tropics insulation and air flow is something to consider. Tradition has said long deep keels with perhaps a ketch rig, but there are many other tried and tested designs for liveaboard long term cruising yachts capable off sailing off shore and surviving the elements. Many though are perhaps looking for short term coastal passages and much time at anchor which has opened the market right up to wide variations in what cruisers are prepared to accept and cruise in as well as holding ample equipment. The choices of keels for yachts is more than varied from the centreboards lifting keels such as Allures and Garcia that lift up totally for you to comfortably take the sand or navigate close to shore above the corals where others dare to venture to the full long traditional keels. Keels come in many different designs, full, long, fin, round, lifting or winged to name a few. 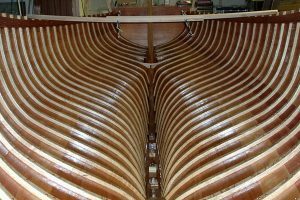 Fuller keels with external lead ballast joined to the external stub by evenly spaced keel bolts or internal ballast where the lead is set lower down in the keel void sealed by resin. Ballast on older yachts can be of iron or cement. Considered one of the most popular and best designs for serious cruising as the skeg protects rudder and prop not being integral to the keel structure. Extended partial-skeg rudders are semi-balanced, longer and perhaps stronger than the traditional full/spade rudder, giving a lighter feel whilst helming. Full Keels with a cutaway section housing the rudder, popular for cruisers, the full keel shape giving great protection to the prop. Close quarter manoeuvring can be interesting but on long passages they hold their own. The most obvious choice for a fast cruiser racer. However perhaps not best suitable for world cruising as it is open to impact and may not give the steering quality in heavy seas. On the cruising circuit you will find the majority of liveaboards opting for cutter or sloop rigs as well as the ketch which offers a wide range of sail options. The removable inner forestays (as well as adjustable back stays) are an added bonus and with many modern cruising yachts having furling headsails and mains handling bigger boats has become far easier. Strom sails are perhaps a thing of the past (and are seldom used as it is too hard to do in a storm) with the multitude of furling and 4th reef options. Spreaders that are lead or swept back are probably not best for a blue water cruiser as they can restrict running or downwind sailing. Chain plate loading must be distributed evenly to the fixing points or they will pull the decks. Single chain plates are fine but lower double plates fore and aft provide more stability for the mast and the deck structure. The can be internal or external but must be easy to access. This is a tough one to win, and again like the Monohull vs Multihull scenario and comes down to personal choice. There are good arguments for both and you gain and loose which ever option you take from greater saloon living space in an aft cockpit to a generous aft cabin in the centre cockpits. Your main consideration on this aspect of design has to be can you get back onto the yacht if you really had to as well as the type of conditions you might be in if this was the case. Some form of stern access and ladders is vital. Check Jaffa, Whitlock or Lewmar for example. There is nothing wrong with having more power but you should target and engine that will give you a minimum of 6-6.5 knots. For the majority of yachts this has already been considered for you and they already have the right power if not more. What’s the access for maintenance like replacing parts such as filters, pumps ? If you had to take it out is it a massive job requiring a potential re-build of the companionway or cockpit or even more ? Consumption what will it give you in terms of economy and range, will it give you that security of reaching land perhaps 600-800 miles away ? Has the previous owner kept good records of maintenance, servicing what spares are held on board. Is there a written log or an hour counter (these can be inaccurate or reset) close to the ignition. Think about spare parts, these days the majority of engines on modern cruising yachts seem to be Yanmar, Volvo, Caterpillar, (Mann and Cummins for power) but will you still get the parts in remote areas for Perkins, Bukh, Ford and Mercedes ? 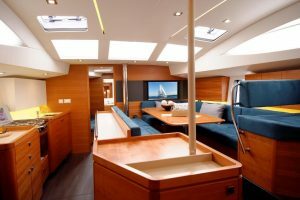 Fit out for cruising: – What do you need ? From dinghy’s to liferafts, EPIRBs to an AIS system on the Nav package make sure you are fully equipped. Don’t skimp on yours or your crews safety at sea, ensure you have attended proper training courses including First Aid. Whilst cruising constantly check safety systems gas to jack stays, keep on top. Where will you be when you most need to contact someone ? middle of nowhere usually or in trouble. There’s plenty of choice fixed and handheld VHFs DSC is best, SSB single side band radio will do the job and keep you in touch with other world cruisers. You also have the expensive option of the Sat phones. Not everywhere you want to drop anchor or secure ashore will the same. Consider longer mooring lines, drum/reel shore lines approx 50m and a variety of anchors. True the modern ones are lighter with a better holding power as well but you will still need plenty of line. 100m chain, a backup with 25/30m. Protection from the sun at anchor or sailing will at some point be crucial so make sure you have more than adequate cover in biminis (fixed and moveable) for shading. Well covered in other sections ensure that below decks has all that you need and are comfortable with, this is where you are going to live. Give consideration to the seasons for warmth and cooling, sleeping cabins and lee cloths for passage making, where are you going to store everything, do you need or want to freeze food if your cruising for very long periods. Travel with a backup for everything, spares are essential when in remote areas and even getting replacement items out can cost a small fortune in postage. Some areas of the world are well connected others could have nothing in terms of facilities. Carry most of what you need, don’t sail with what you don’t it just takes up valuable space. Where will your money go after you’ve bought the yacht, what can you expect ? Ensure you really know to sail and enjoy it. Complete some offshore sailing and assess what you really are looking for and want to do in terms of your sailing. How big a yacht do you need and what will it be equipped with, budget for spares and repairs. The more advanced you go the more this will cost you, remember the budget and stick to it, keep it simple. Employ a surveyor to inspect the yacht you finally decide on. Where possible try and inspect and even sail as many brands as you can, charter, sail friend’s yachts, visit boatshows. Draft information on what aspects of each yacht you liked and disliked. Narrow down what you are looking for, if you can find the exact model in a private ownership research their blog for further info and ask questions. Do you like sailing, have you been on long passages, are you comfortable and have you ever lived on board for long periods of time. Can you sail ? If not head for the floating class room and get on some courses to gain experience and qualifications. Living aboard for long periods is not for every sailor, not all costal or Med sailors enjoy the experience of being offshore , it is a different sailing. Go on a taster trip to find out more. The perfect boat does not exist, it is always a compromise, but ensure you put safety first, construction, comfort, speed and she is fit for the sailing you want to do. You have a greater choice if it is more local sailing you are interested in, head offshore and your requirements change and the choices narrow. Set yourself a sensible time line for purchasing, this should be a minimum of 6-12 mths and longer if it is a new yacht you are ordering. Research yachts for sale that suit you, your budget and your sailing. As the perfect yacht does not exist keep an open mind and keep up with technology. If you make a poor choice you may be dogged with all sorts of problems from structural issues to comfort nightmares and long frustrating period of not sailing and great expense. Yachts are a huge investment and you need to invest this money very wisely normally having planed and saved for decades to reach the point of looking to that new horizon.